Mimosa Lodge is a beautifully renovated 15th Century stone cottage located in 2.5 acres of landscaped gardens in the heart of the Brittany countryside. The cottage sleeps up to 10 people in 5 bedrooms making it ideal for an extended family holiday or perhaps holidaying with a group of friends. The cottage has a lovely large open plan lounge area with a beautiful feature Breton fireplace and log burning stove and stone walls and exposed old oak beams that give the cottage plenty of character and charm. The kitchen is well equipped with everything you need for cooking during your stay and has a large dining table that can seat up to 10 people. Upstairs are 5 large bedrooms including a fabulous master bedroom with super king size bed. There’s also a triple bedroom with a single bed and bunk beds, perfect for children to share. Outside, Mimosa Lodge has its own lovely private garden area with tables, chairs, parasols and a bbq. There’s also plenty of communal spaces shared with the other gite on site, including a games room with dartboard, table tennis and a variety of other games, a grassed paddock, boules pitch and plenty of space for the kids to run around and play badminton or football. There’s also a 4 metre splash pool available to cool off in during the summer months. 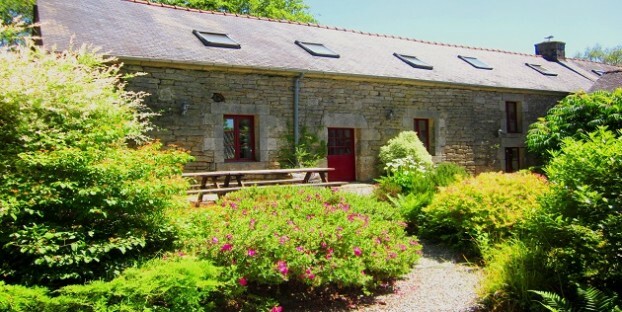 Located just within Morbihan, on the border of the Finistere and Cotes d’Armor departments, the cottage is ideally situated for exploring all of this wonderful peninsular of France. The bonus of being slightly inland is that although the fabulous beaches and coastlines of Brittany are still easily accessible, you can enjoy the traditional tranquil Breton way of life without being disturbed by the fluxes of the tourist seasons. The nearest village to Mimosa Lodge is Langonnet and it’s the centre of the Breton language, proudly upholding its history and culture still today. Throughout the year there are a variety of traditional festivals held locally including the Fete de La Crepe in Gourin, the Fete de Brodeuse in Pont L’Abbe, plus the internationally acclaimed Lorient Interceltic Music Festival. If you prefer a more relaxing holiday, be sure to visit Etang de Lagonnet, a lovely lake with a man-made beach, picnic table and children’s play area. There’s a well surfaced walking path skirting the water – a gentle stroll around the lake will take about 30 minutes. For keen fisherman, freshwater fishing is also available here. Mimosa Lodge is owned by Holly Hughes and her partner who are both English and have spent the last 18 years working in the tourism industry which has meant working and travelling extensively through France. Of all the diverse regions they have visited, they have found Brittany to have the most welcoming people, the richest culture and the best seafood! They love welcoming guests and sharing their beautiful part of France with them.